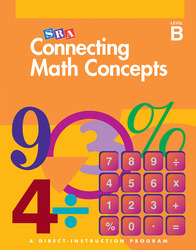 Connecting Math Concepts introduces ideas gradually and teaches students the connections between concepts. Focusing on the "big" ideas of mathematics, Connecting Math Concepts teaches explicit strategies that enable students to master difficult ideas such as ratios, proportions, probability, functions, and data analysis. Detailed explanations and guided practice move students toward independent work, ensuring that students gain success and confidence as mathematical thinkers. Teacher Materials Package includes interactive white boards displays, teacher presentation books and eBook, teacher's guide and eBook, and assessment book and eBook.